It's been a decade since the January 19th, 2006 launch of the New Horizon's Spacecraft. Richard Binzel reflects on this capstone to the five-decade long quest to explore all the planets known at the start of the space age. Read this story at Science@MIT. At MIT, we are all explorers. Our scientific frontiers range from the sub-atomic realm, to the complexities of mathematical and physical systems, to the farthest edge of the universe. Yet no frontier combines the mens et manus spirit quite like the human exploration of space. Interplanetary spacecraft are conceived by the human mind, built by the human hand, and literally carry our innate curiosity to its most distant reachable limits. My passion, embraced by MIT throughout my career, has been to use the tools of astronomy to build the rationale for advocating the highest priority destinations for sending our robotic emissaries on these voyages of discovery. Out of all worlds in our solar system that astronomers have known as “planets,” Pluto has always been the most mysterious and ostensibly unreachable. Its small size (about 2/3 of our Moon) and great distance (about 40 times further from the Sun than Earth) have engendered both the mystery and controversy. “Dwarf planet” is in fact a good description for Pluto, mindful that the Sun itself is classified as a “dwarf star.” Just as the Sun is a star, Pluto remains correctly describable as a planet. Most important, however, is that the semantics do not matter scientifically. Each and every scientific question we have about Pluto is unrelated to its label. Figure 1: Building the case for large-scale science projects, such as spacecraft missions, requires an entire foundation of fundamental research to support the capstone. This “Pyramid of Planetary Exploration” is adapted from Binzel (2012; Science 338, pp. 203-204). Our drive to explore Pluto is not just because “we have never been there before.” Significant public resources for any project, whether it be a particle collider, giant telescope, or interplanetary spacecraft, require solid rationale. 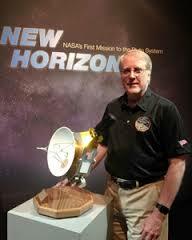 (NASA’s New Horizons mission to Pluto cost $700 million, an intermediate price range for planetary exploration.) One has to make the case that significant scientific breakthroughs can be gained by the mission and that every other possible (less expensive) avenue has been pursued to the point of impasse. In essence, spacecraft exploration forms the capstone that rests upon our previous knowledge while integrating it together (Figure 1). My own exploration of Pluto can be traced back to the discovery of its large satellite, Charon, in 1978. This breakthrough, roughly 50 years after Pluto’s discovery in 1930, happened at the United States Naval Observatory in Washington, DC where I was an undergraduate summer intern. My assignment was to check previous historical records of Pluto observations to help confirm the satellite’s orbit. With that orbit and the application of Kepler’s Third Law, Pluto’s low mass became determined. Of particular excitement to me was the realization that Charon’s orbit was nearly edge-on as viewed from Earth, thereby providing a unique geometry opportunity for astronomers: Sometime in the 1980s Charon would begin a once-per-century series of transits across the disk of Pluto as part of its 6.4-day orbit around their common center of mass. Even though both bodies remained unresolved, uneven variations in the brightness drop during the few hours that Charon “scanned” across Pluto’s disk would reveal underlying bright and dark spots on its surface. Thus, careful measurements and analysis of the transit light curves (measurements of brightness versus time) could be used to directly map Pluto’s otherwise indiscernible surface! Seemingly interminable years of monitoring Pluto’s brightness followed. As a graduate research assistant at the University of Texas McDonald Observatory, I spent countless nights at the telescope together with Pluto. (There was an uncertainty of several years as to when the transits might first occur due to having just a preliminary orbit for Charon.) Finally just before morning twilight on February 17, 1985, as I entered the numbers into my programmable TI-59, I found Pluto’s brightness changing in a way I had never seen before. The first definitive transit was detected and the scanning of Pluto’s surface had begun. Over the next 5 years, including the time of my arrival at MIT as an Assistant Professor in the Department of Earth, Atmospheric and Planetary Sciences (EAPS), transits across different regions of Pluto’s disk continued to be observable. While I continued the frequent telescopic measurements, transformation into the map became a joint project and turned into a Ph.D. thesis for my own student Eliot Young. Figure 2: Pluto as mapped from Earth-based telescopes using planetary transits in the 1980s. Right: Pluto at the same rotational orientation as seen by the New Horizons spacecraft in July 2015. During the 30-year interval, Pluto’s north pole has increased its tilt toward the Sun causing arctic winter (no sunlight) for the southern latitudes - Image courtesy: R. Binzel. Our mapping results (Figure ii) showed Pluto to have a remarkable surface of contrasting bright and dark regions. Seeing these contrasts only whetted our curiosity. What process could create these patterns? The answer came through a monumental discovery by my EAPS colleague Professor James Elliot (1943-2011). Elliot pioneered the technique of using stellar occultations to probe the atmospheres and regions surrounding planets. In brief, as a planet moves along in its orbit there are occasions where an Earth-based observer will see it pass in front of a distant star. If a precise prediction can be made for the timing and location of that planet’s shadow across the Earth’s surface, the manner in which the star’s light dims as it sets and rises behind the planet can detect and measure the properties of its atmosphere. Using an airborne NASA telescope to position himself in just the right location on June 9, 1988, Elliot found the star’s light changing gradually as it disappeared and reappeared from behind Pluto. That gradual change meant Pluto had an atmosphere! What’s more, it meant the bright and dark regions on Pluto must be the results of seasonal changes where volatile ices (like methane) sublimate to the gas phase when Pluto is closest to the Sun and re-deposit themselves as fresh bright ice when Pluto is far from the Sun. (Pluto’s distance varies from 30 to 50 times the Earth’s distance from the Sun over its 248-year orbit.) Now we had the rationale for why we should explore Pluto directly by a spacecraft: To reveal planetary climate change processes unlike any that had ever been previously explored. Getting a Pluto mission out of the Washington beltway and to the launch pad proved to be longer and more difficult than any challenge we were to face once in space. Throughout the 1990s no less than six of our concept studies were proposed, approved, and then cancelled. Finally in 2001, the New Horizons mission concept emerged as the top candidate to fly to Pluto, with the unstoppable force who is Alan Stern (Southwest Research Institute) as the Principal Investigator. A National Academy of Science Decadal Survey recommendation in 2003 that ranked a Pluto – Kuiper Belt mission as the highest priority planetary mission was the imprimatur we needed for secure funding. The race to the launch pad was on, where a 2006 launch would allow us to use Jupiter for a gravity assist. If we were late by more than a few weeks, Jupiter would no longer be in the right location to be of help along the way. Flawlessly, those first images arrived and astounded us all. Pluto itself had delivered a strange and wonderfully bizarre landscape that exceeded the wildest reaches of our imagination. Our maps from decades ago proved correct: Nature is in fact sculpting a planetary world unlike that we have ever explored before and challenging us to explain the details now confirmed and fully revealed. For example, within the bright regions we see evidence of flowing glaciers of nitrogen ice that stretch the field of glaciology to the farthest reaches of our solar system. The youngest (mostly crater-free) bright regions are not the polar caps, but rather, a near-equatorial heart-shaped region now named Tombaugh Regio after Pluto’s discoverer. (All names are informal until approved by the International Astronomical Union.) Understanding what drives the freshest ices to the equator, rather than to the poles, is a mystery I am working to solve with my current graduate student Alissa Earle. Detailed measurements of the atmosphere show complicated haze structures that the Earth-based stellar occultation measurements had first glimpsed decades ago. That scientific confirmation of Elliot’s discovery, and his mentoring of New Horizons’ team leaders, make it fully appropriate that the name “Elliot” is proposed for one of the largest craters seen prominently in the images. In essence, MIT has its own piece of real estate in the far reaches of our solar system. How does one stay engaged in an exploration endeavor spanning more than 35 years? I would say that this is just one example of the characteristic determination found among faculty at MIT engaged in high risk and high reward research and that it is made possible by the Institute’s long-term commitment to tenured faculty. Overall, I am most overwhelmed with gratitude for the privilege to have been allowed to pursue this quest undaunted. Seeing my own and other EAPS students’ rise to prominence, becoming critical contributors to NASA mission success, has provided me with the greatest professional satisfaction that I have ever experienced. Rick Binzel is a Professor of Planetary Sciences and an MIT Margaret MacVicar Faculty Fellow. He is the inventor of the Torino Scale, a method for categorizing the impact hazard associated with near-Earth objects (NEOs) such as asteroids and comets.